• Full Term Outdoor Curing Blanket (7 day curing duration). • Lightweight: each roll weights approx. 50 pounds. 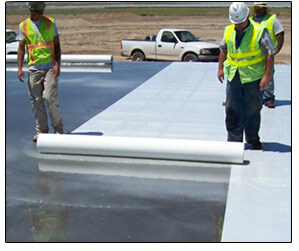 • Vapor barrier helps reduce solar heating of the slab. • Disposable: single use fabric eliminates cross contamination between slabs. • Less material overlap: overlaps of 2-5” mean less waste than most other curing methods. • UltraCure SUN meets or exceeds standard specifications for sheet materials for curing concrete. Removing air bubbles is easy with the UltraSqueeg™ roller squeegee. As the wet curing blanket is rolled out and begins to absorb water, pockets of air can sometimes form between the blanket and slab. To assure a consistent finish and coloration, removal of the air pockets and undesired wrinkles is vital. The UltraSqueeg roller removes the pockets and presses the blanket into the curing water assuring consistency during the wet cure process. The UltraSqueeg roller works great with all of our wet curing products including UltraCure NCF, SUN, MAX and OneCure. The Ultimate Outdoor Wet Curing Blanket. UltraCure SUN™ possesses the same absorptive properties as UltraCure NCF. UltraCure SUN provides constant hydration and maintains a 100% relative humidity condition on the slab for the entire 7-day curing period. The single-use blanket remains flat longer on the surface than most other methods, and stays in place without the need to weight down the edges. Because UltraCure SUN wicks itself to the slab, you will notice less foreign material including dust, debris and contaminants on the concrete surface. A cleaner surface will allow easier installation of surface hardeners. As with UltraCure NCF, the superior water retention ability of UltraCure SUN allows the blanket to absorb more than 46 gallons of curing water per 1,600 sq. ft. roll, providing the critical moisture required for the long term wet curing of concrete surfaces. With typical application and proper installation, the superior absorbency demonstrated by UltraCure SUN means there's no need to re-wet the slab. Using UltraCure SUN also helps reduce material costs, installation labor, and totally eliminates the need of costly storage and transportation of traditional wet cure methods.